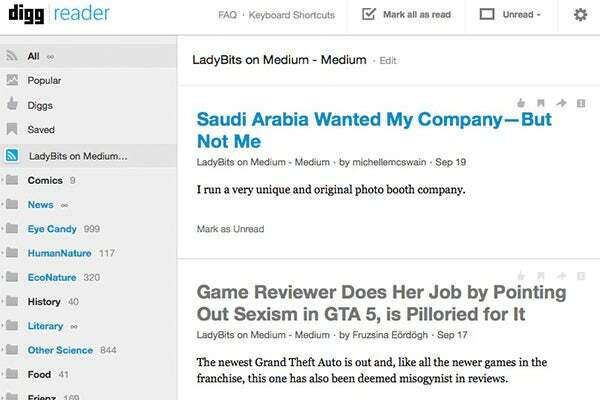 Introducing LadyBits, an ultracool collective of tech journalists who look at the world with smart, lady lenses. And since we're always in the market for the best stuff out there, we'll feature its know-how on the regular. Below, check out one of LadyBits' roundups, prepared especially for Refinery29. It's barely been three months since Google officially shut down Reader — though it already feels like a lifetime. Since its launch in 2005, Google Reader was the one-stop shop for those of us who wanted to keep tabs on our favorite news sites and blogs without having to manually check each URL daily. So when Google announced the closure of Reader, it was met with a loud wail from the Internet as we tried to imagine our lives without its service. But, in one way, its demise was a good thing: It spawned a flurry of replacement sites, each with different features that appeal to different types of users. Whether you’re a Google Reader alum still flailing to find the best replacement, or you're new to the aggregate scene, here’s a breakdown of RSS feed readers now that the fury has smoothed out. If you want to scroll through feeds quickly in plaintext, Digg Reader and AOL Reader are the RSS picks for you. It may seem strange to lump the two together — besides the fact that both were built by companies generally considered past their prime — but if you compare them, they are nearly identical. Both load quickly in stripped-down interfaces with basic sharing options. In general, AOL’s interface is a bit more customizable: You can choose to show more or fewer images, and there are more sharing options. But the major differentiator is mobile access: Both have functional mobile sites, but Digg has already released iOS and Android apps while AOL Reader, still in beta, has not yet fulfilled its promises to build them. If Google Reader was a print newspaper, then Feedly is a glossy mag. Instead of focusing on just the text, each story has a featured image embedded in a stylized, tiled layout. 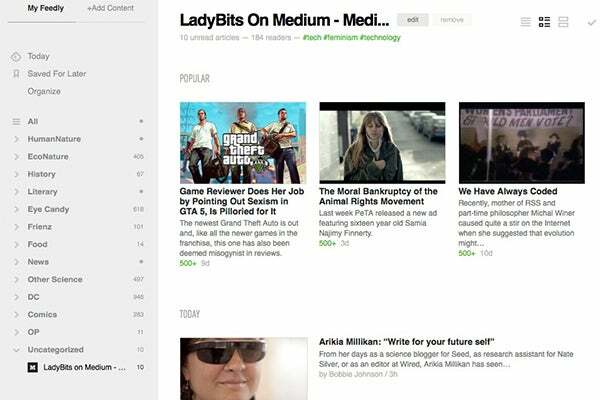 But that doesn’t mean it’s lacking on the tech side; despite the heavy image load, Feedly runs as smooth as butter. Additionally, it has a plethora of sharing options, apps for both iOS and Android, and a mobile site. And, on September 18, Feedly opened up its API to developers, meaning third-party apps are on their way. For the power-user who prefers the stripped down black-and-white look, Feedly’s stylized color is a bit distracting. But, if you’re willing to shell out for the premium version ($5 a month or $45 a year), you can access one game-changing feature: search. If you use an RSS reader as an archive of all your favorite sites, this enables you to search them all at once — and find that gem of an article you vaguely remember from four years ago. The Old Reader and Reader2000 were born from a Google Reader scandal of a different era: the shutting down of sharing options in 2011. Before Twitter and Facebook dominated article sharing, you could share articles within Google Reader to a small network of friends. When Google launched G+ and shut down this feature, it was met with outrage from a small group of power-users — many of whom went into exile onto one of these two sites. 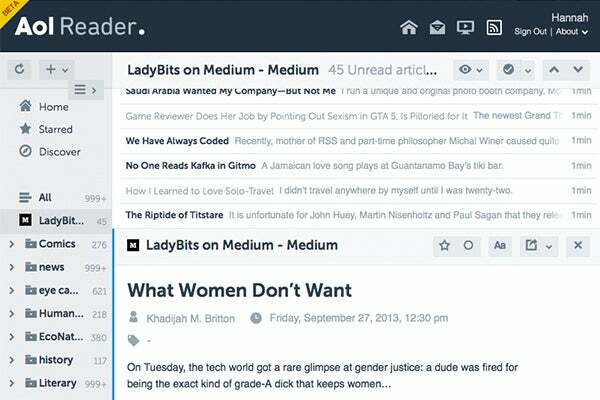 Meanwhile, Reader2000 mixes more qualities of social media in with RSS feeds, with article discovery and discussion dominating the experience. You follow the shared items of other users — friends you know or random people from the site — and these can generate extensive comment sections, making it feel more like a small pseudonymous message board than a simple reader. You can read and share RSS feeds in Reader2000, but the interface is a bit clunky; more useful is its bookmarklet, which can grab highlighted text or images from any website, whether you subscribe to the feed or not. 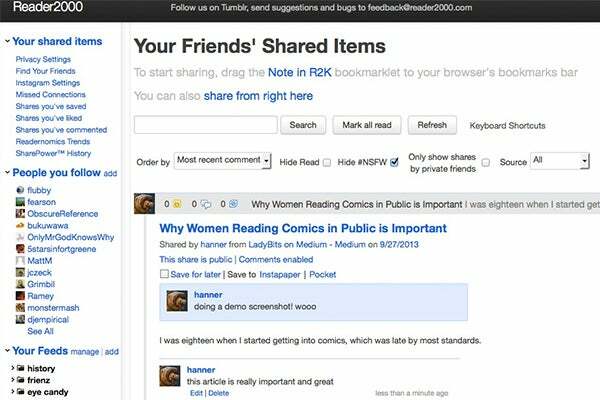 The sharing and reading community is very active, and many of the users become friends and meet offline. In some ways, it feels like the opposite of the original Google Reader — it’s more about the conversation than a walled-off reading experience. Another popular option is NewsBlur, which has more of the utilitarian look of a desktop program than the graphic design-minded interfaces we’re used to seeing on the web. 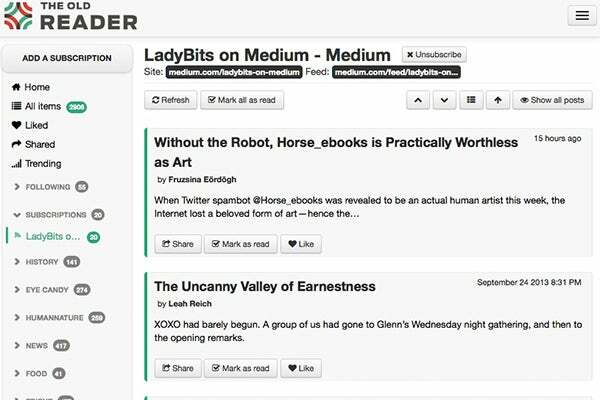 Other new readers like InoReader and HiveReader, launched since Google’s initial announcement March 15, offer clean reading experiences, but still feel a bit glitchy. These are probably worth revisiting in a few months as the developers have more time to test and tinker. And FeedSpot — which has the elusive search feature — is still in beta testing, but from screenshots looks nearly identical to Google Reader. There is no one perfect reading experience for every person. Some of us want a plain text firehose of information. Others want a vibrant layout and community to share and discuss with. So pick a reading experience from the list above that’s as close to your preference as possible. It may not be perfect, but combined with the recommendations we receive on Twitter and other social media sites, we should all be able to find excellent writing and media that suits us.